As the talent wars wage on and the likelihood of poaching a C-level executive from Google are close to zero, founders are turning to recent MBA grads for hiring needs. Fifty-seven percent of business schools claim startups -- companies less than a year old -- are ramping up their full-time recruiting efforts for MBA grads, according to the MBA Career Services & Employer Alliance's Spring 2013 Recruiting Trends survey. 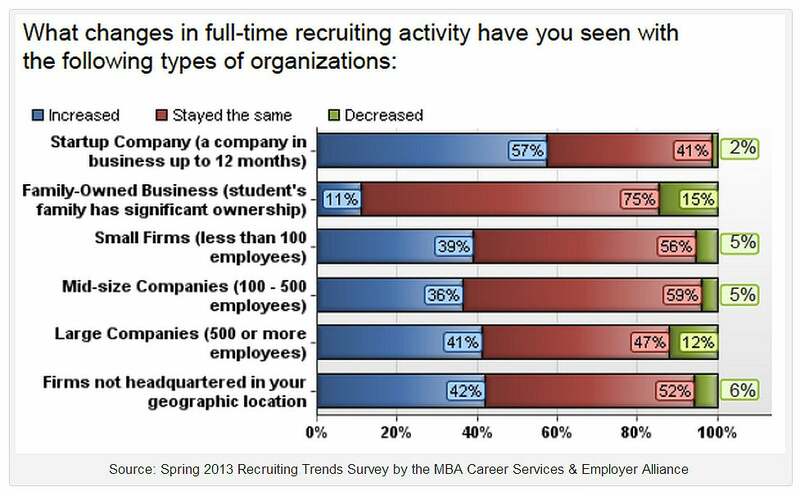 By contrast, only 41 percent of larger companies -- those with 500 or more employees -- are doing so, notes the survey that polled administrators from 84 MBA programs (see graph below). “A growing number of MBA students are focusing on entrepreneurship, either by starting their own business or helping other students start theirs. Reports from large and small MBA programs confirm the increased student interest in a range of entrepreneurial endeavors,” Jack Oakes, assistant dean for career development at the University of Virginia’s Darden School of Business, said in a statement. Recruiting increased in all industries with more than 40 percent of colleges seeing a spike in technology, petroleum and energy, consulting and consumer products.